SCVHistory.com | Valencia | Fire Guts The Greens, 26501 McBean Pkwy, 11-6-2011. 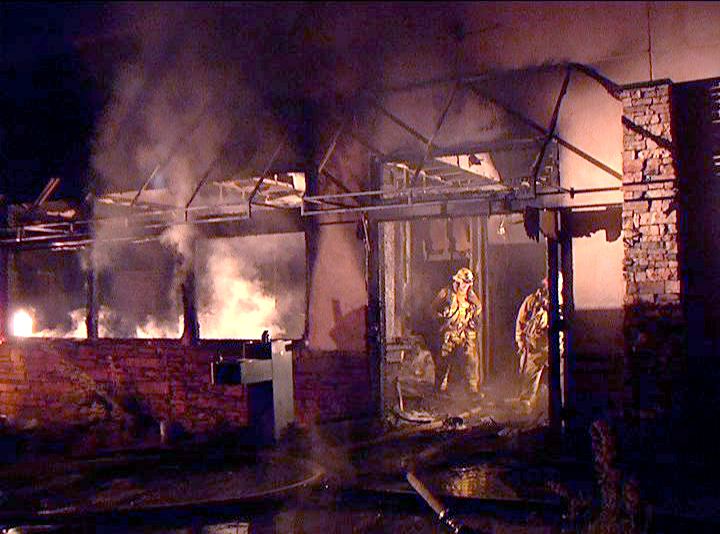 November 11, 2011 — Fire has completely gutted the former Gimme Grill sports bar at The Greens in Valencia. The mysterious fire broke out Sunday around 5 p.m. inside the building, which has stood vacant at Valencia Boulevard and McBean Parkway, across the street from the Westfield Valencia Town Center mall and adjacent to the city of Santa Clarita's bus transfer center. Nearby residents reported hearing an explosion, but Capt. Mark Savage of the Los Angeles County Fire Department said the fire's origin was not yet known. He said investigators were combing the wreckage for any sign of arson — the one category of serious crime that's on the rise in Santa Clarita. The Greens opened with high expectations in the late 1990s as an upscale putting course and pro shop. In later years it devolved into a hangout for out-of-town gang bangers and other young adults who often drank to excess and engaged in fights, frequently with deadly weapons. In 2006 the property was purchased for $6 million by New York-based Brisam Valencia LLC, which planned to raze the bar and erect a seven-story, 200-room Sheraton hotel on the site. The Santa Clarita Planning Commission approved the hotel plans in 2009, with development expected to start in 2010. But when it reached the City Council for final approval, the developer put the project on hold — where it remains. The location has been closed for about two years, a sheriff's deputy said.